It could have been a celebrity pulling up in that Land Rover. Maybe a city broker, or even a politician. In fact it was all of those things – Nigel Farage. Emerging from the vehicle, the UKIP leader wore a hardened smile ready for the press pack, along with a few awaiting fans. His second appearance in Great Missenden marked the party’s launch of its European election campaign and the crusade started here in The King’s Arms. It was frustrating; UKIP had promised to give me ‘all access’. I was to share every second of his visit to Great Missenden, Chalfont St Peter and Beaconsfield, even ride with him in his car. And Nigel, your everyday, pint-in-hand man of the people, would not have seen a problem with it, surely? Except in Edinburgh police were forced to lock him in a pub as rowdy protesters barged their way in. Monday (January 21) did not fare much better when a protester hit him with a placard scrawled with ‘Nasty Little Nigel’ in his home county of Kent. An outspoken right wing politician with divisive views on immigration may not expect anything less. So no room in the car for me and camera woman Amber Stubbings of APS Media Productions. More security meant less space. 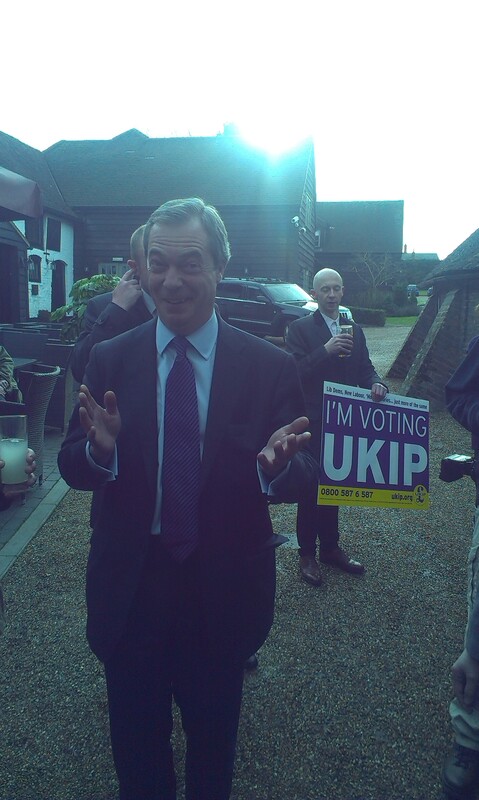 Nigel greeted the small crowd, shaking hands and appeasing a potential UKIP candidate from outside the county. She wanted his endorsement. He, according to his PA, wrote ‘the party would welcome more women councillors’. Straight to the bar – no waiting in line here – and the leader ordered a pint of Betty Stogs Ale. The buzz of UKIP councillors, of which there are six Bucks County Council (BCC) including an excited Alan Stevens of Great Missenden, was infectious. Nigel was placed opposite me in a portioned off room, and although people swarmed around us, it felt as if we were quite alone. I once spoke to Mr Farage last year, a brief telephone call. It was after councillor David Meacock defected from the Tories to UKIP. Not expecting anything, I was surprised when he showed a flicker of remembrance. We slipped into conversation about his day. He had just come down from Manchester, he said, with a sip of his drink to mark the end of each sentence. The interview covered Europe, unsurprisingly, and the global economic strategy. But there is so much controversy dripping from this man’s words that to concentrate on comments like ‘women must sacrifice family life to succeed in finance’ seems a job for the nationals. I wanted to know about Nigel Farage. The former city trader who is rattling Britain’s three major parties. The 49-year-old who, aged 21, was seriously injured after being run down by a car. The car crash victim who, while recovering, was diagnosed with testicular cancer. The plane crash survivor whose UKIP banner wrapped around the rudder as his plane hurtled to the ground four years ago. Although seriously injured, both the pilot and himself survived. Afterwards, light aircraft flyer Justin Adams threatened Nigel Farage, became depressed and was found dead last December. At this point he swallows and looks away. Under the glare of flashing photographers, he may be thinking of the cancer, the next public talk or just his impending bangers and mash. It was Chalfont St Peter Community Centre next where a crowd of more than 300 waited in anticipation. Outside of the hall, I lingered next to Nigel who stared quite sombrely at a poster of his face. Then it was showtime. I positioned myself at the front. His charisma, charm and humour was delivered effortlessly but as for me, I was looking forward to the dinner at the Bellhouse Hotel in Beaconsfield. My reservation, a seat next to Nigel, among his councillors, his friends, would put be in the deep of it. That’s where I hoped to get my splash. Straight away he made light of a recent national scandal. A UKIP town councillor from Oxfordshire had put the party into disrepute by blaming flooding on the Prime Minister’s gay marriage proposals. The type of story that haunts UKIP’s urge to be taken seriously. He joked about the rain outside and highlighted the little media attention, he said, of a Conservative district councillor in London who was arrested for threatening someone with a firearm that week. Councillor Nick Bustmaster was charged with possessing an imitation firearm and he awaits trial next month. After a resounding applause, the crowd were now eating from his palm. He exclaimed this was his first public south east region event, though he had appeared a year before in Great Missenden. UKIP’s rise in support was partly down to distrust of the three parties who “look the same, are from a very narrow group of schools, nearly all go to Oxford, they nearly all do sound the same and all come from the same backgrounds,” he told the crowd. According to www.smith-institute.org.uk nearly 24 per cent of MPs went to Oxford or Cambridge. He went to renowned Dulwich College, a member of the Eton Group, and decided to skip university for city trading in London. He founded UKIP in 1993. If there is one thing to get the political pulses racing in Bucks it is High Speed Rail. The controversial project was endorsed by UKIP’s 2010 manifesto, one he wishes to distance himself from. He paints it as a ‘gigantic white folly’ with little economic benefit. His disgust of wind turbines and fervour for fracking pushes an audience member to cry: “I will be voting UKIP!” It is going well, no signs of protest in Chalfont St Peter. Nigel then follows with a risky move, encouraging the audience with a bit of exercise. “Hands up who are not UKIP members?” he says. About 75 per cent shoot up. And then a question from an American immigrant on why he should come set up business here. Nigel assures him he is welcome and “sensible immigration policies” is the goal. And the talk’s final point clearly satisfies the crowd. Off to dinner. Nigel believes UKIP is doing very well in Bucks. The county council has six representatives. They will be there for dinner and I have planned to join them. Yet after dropping off Amber, I get lost. The pitch-black dark lures me into a narrow Beaconsfield lane swamped in at least four feet of floodwater. My little car is stuck deep and hopelessly in the middle. Not the splash I was hoping for. By the time I get to dry land, and to the hotel, I see Nigel’s table with two empty seats – one mine – and the man delivering an after dinner speech. I will let you guess how I felt at this point. Moving sheepishly to a back table, I listen to his more intimate anecdotes. It was about Mr Van Rompuy. Nigel recalls: “I said to him ‘You have the charisma of a damp rag and the appearance of a low grade bank clerk, the question that I want to ask, the question that we all want to ask is who are you? I heard some controlled gasps and subtle cringes from the company, otherwise committed ‘Kippers’. He said the European Union asked him to apologise or pay a fine. He paid. Afterwards, I offered Nigel, a well-known smoker, a cigarette. He had just had one and mentioned his sons smoke the same as me. We sat down. Germany, he says, is much better for smoking with separate rooms. His face looks tired, maybe tired of repeating the same jokes, but he seems pleased. If they top polls here it’s all about perception, he says, psychology. Kate, a new UKIP convert from Ealing, joins us to vent her rage at a radio presenter mocking Nigel. Why do people mock him? “Why did they imprison Galileo? They said Galileo you may be right but we can’t afford for you to be right. There is nothing new in this,” he answers. The next talk at Beaconsfield High School goes much the same. A crowd of about 400 listen to the routine, he is like a comedian on tour. Same topics covered with no pin-dropping questions. One thing that hits me is Ian, 65, a crowd member, jokes he is the youngest there. He is not. I meet a group of 18-year-old students considering a UKIP vote on the way out, as well as a 17-year-old girl helping put away chairs, albeit her dad is a member. The May 22 European elections are pivotal for the party. The anti-European message scares off people, almost conjuring up an obscure racist agenda. As he finishes his night, a Bob Monkhouse quote he used in the Chalfont St Peter speech strikes me: “When I was growing up I told my friends and my parents I wanted to be a comedian. They all laughed at me. They’re not laughing now.” No Nigel, we’re not.